Calls to Haven on 0845 numbers cost 7p/min, plus your phone company’s access charge. You can call this Haven contact number to speak with customer service about new bookings, existing bookings, complaints and all other enquiries. What is the main Haven Contact Number? The main contact number for Haven is 0845 682 0211. You can use this number to speak with customer service about all enquiries. You can also call Haven on their local rate number which is 0330 100 6633. When you search online for “Haven Contact Number” you are greeted with the following google snippet result. The number provided is the local rate number you can call to reach the main customer service switchboard. The Haven customer service team will be able to help you with all of your enquiries, so if you are making a new booking or just checking possible dates, then you should call this number. This local rate contact number is typically included in call packages, but if you are unsure about how much calling this 03 should cost, then you can read more about Haven call charges here. Haven have a dedicated booking team ready to take your call, and get you booked with your new holiday. Haven also have a dedicated contact number for people with existing bookings, which is 0333 200 2525. 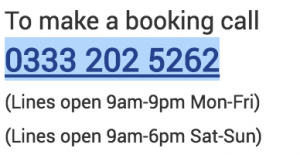 You should use this number if you have already booked your holiday with Haven, but want to call about you booking. You may want to call regarding your current payment plan for your holiday, or you may want to see if you can additional people to your booking. Or you may just want to ask a quick question such as do they allow pets. Haven also provide a live chat option on their website which you can find here. Having a live chat option is a great additional way to contact Haven. It provides an easy way to ask quick queries you might have. If you want Haven to call you back about your query, then you can always leave your contact details and phone number so they can contact you. Haven strive to make sure you have the best possible break with them. However, on occasion your holiday might not live up to the Haven standard. Haven have a complaints procedure in place to make sure the process is as simple as possible. The quickest and easiest way to contact Haven holidays to raise your complaint is via email. The email address you need to send your complaint to is guest.relations@bourne-leisure.co.uk. When sending your complaints email, make sure you detail as much information as you can as this will help Haven process your complaint much faster. Don’t forget to include all of your contact information, including your phone number, so Haven can contact you back. You can use this head office address to send mail to Haven, and this can be an effective way of raising a complaint. A well written complaints letter is a much better way to have your complaint taken seriously. Which? wrote a really good article on how to write a complaints letter, you can check this out here. Haven are also active on all the main social media platforms. This gives its customers another excellent way to contact Haven. Although the Haven phone numbers provided here are the quickest and most effective way to get your query resolved, you can also contact them through social media. We’ve highlighted the key social media platforms that Haven use below. You can see the Haven Facebook page here. You can find the “send message’ button at the top right corner of the Facebook page. Here you can see that Facebook also provide information on average response times. Haven on Facebook typically take a few hours to respond to customers messages. This is why we always recommend calling their customer service numbers above to get a much quicker response. You may get a faster response from Twitter, and you can find their page here. 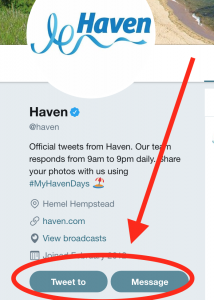 Twitter gives you the option to message privately, or use their tag @Haven to tag them in a public post. Contact Haven via Instagram here. Or via Google Plus here. You can also watch their latest TV ads and other video content on YouTube. So when you are planning your next trip away, you can also find the right companies contact number and department. A few examples of the type of holiday contact numbers we have. Be sure to check out these pages, and bookmark this website to keep up to date with Haven contact information.